This week we sadly lost my grandfather. He was an incredible man who loved to dance, garden and be with his family. I am just so happy that my kids got to spend as much time with him as they did. I was a little nervous about explaining his passing to the Bee. However, after telling her that he was gone she sat quietly for a moment before looking at me and saying "you know what I member about him, he really liked swimming." Sometimes grown-ups teach things to four year olds and sometimes we learn things from them. This week a four year old taught me that the best way to handle the loss of someone you love is to "member" all the stuff that made you love them to begin with. 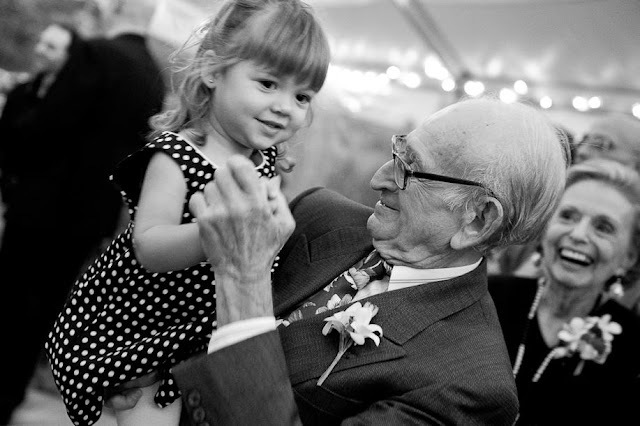 By the way, I didn't take this incredible photo of my Grandfather dancing with Bee a few years ago at her aunts wedding. My friend Kory did and I thank her for capturing this moment that has made me smile all week. So sorry to hear this Katie. Hugs!